We’ve all been there. The drummer is stuck in traffic. The guitarist is stuck at work. And you’re stuck at front-of-house (FOH) with a hyped up lead singer and bass player and no way to dial in a front-of-house mix, let alone set up the singer’s in-ear mix. With many of today's digital mixers, it is possible to do a complete soundcheck for the evening's performance before a single musician arrives. The key to being able to pull off this feat of technological magic is to have a multi-tracked recording of an artist's prior performance and a way to play back each track as separate channels on your digital mixer. StudioLive digital mixers revolutionized the Virtual Soundcheck by incorporating a continuously bidirectional audio interface with Capture, a multi-track application that was built to record live performances. Designed exclusively for StudioLive mixers, PreSonus Capture configures instantly and offers all the features you need to ensure your live multitrack recording is as flawless as your performance. Bidirectional communication with StudioLive mixers creates a unique one-to-one workflow that streamlines live recordings. Because StudioLive mix scenes can be stored with Capture audio sessions and Capture can remotely control key StudioLive digital mixer functions, the Virtual Soundcheck mode built into Capture provides an automated experience that is unavailable with other digital mixers in this price class. While this article guides you through the steps of doing a Virtual Soundcheck with a StudioLive Series III mixer, the principles are largely the same with any digital mixer that offers an integrated multi-channel audio interface and a multi-track recording application. The difference is that Capture automates the process to make it fool-proof and stress-free. To begin, create a new Session in Capture, preferably metatagged with the Artist, Performance, and Location information. The saved Capture Session will open. 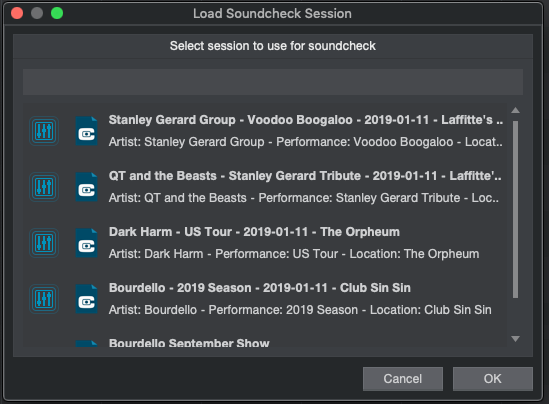 If your StudioLive digital mixer was synced to Capture when the recording was made, you will have the option to load your StudioLive mix scene at the same time. Capture will automatically engage all the digital returns on your mixer, so that you can playback audio immediately and dial in your mix. When you have finished setting up your mix, click the Virtual Soundcheck Mode button again to exit. This will remove the audio from the session and disengage all the digital returns on your StudioLive, leaving the track labels in both Capture and on your mixer. 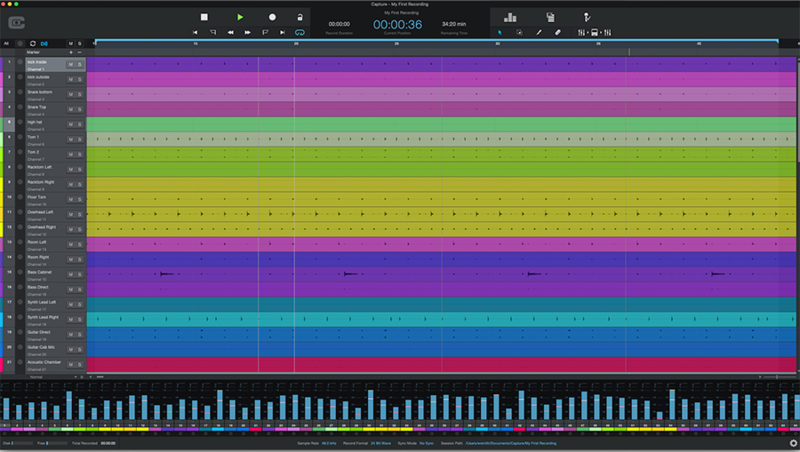 At the same time, it will arm all tracks in Capture for recording, so that you are ready to record a new performance.